The development of AustralianClinicalTrials.com is the culmination of Datapharm Australia’s holistic approach to clinical trials. A fusion of community building, social media, and online interaction drives both the design and purpose of the website. Simply put, this is the next logical step in Datapharm Australia’s mission to provide quality assistance and the best value at every step of the clinical trial process. With the launch of Australian Clinical Trials, both your needs and the needs of the clinical trial community can be better addressed. No matter where you reside in the clinical trials ecosystem, Australian Clinical Trials can help you. 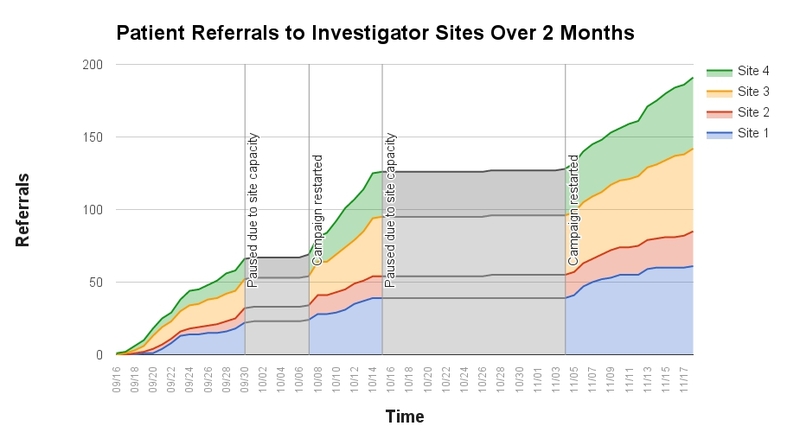 Investigator sites can manage and control their own clinical trial promotional pages for free. Interested participants (and referring doctors) can easily search for and find the location of recruiting clinical trials and their sites, which is something that is not always clear from the various public registries. Free social media templates can be generated for ethics approval, and social media advertising can be provided to direct potential participants to online pre-screening questionnaires and information about studies. Sites can promote themselves by way of a free profile page within minutes (of which there are currently 50+). This in turn displays and promotes their experience, expertise and speciality focus. Finally, companies setting up clinical trials will be able to easily assess and choose the best clinical trial sites using accurate information rather than accessing expensive private databases. Whether you are a clinical trial sponsor, a site, or just generally interested in clinical trials, read on to find out how Australian Clinical Trials can help you right now! Australian Clinical Trials aims to increase the visibility of ongoing clinical trials in order to make participation and research more accessible to the general public. Knowledge of clinical studies is essentially limited to promotional events for most people. Asking the general public about breast cancer research would result in answers referencing pink ribbons and fun runs. Similarly, ALS would invoke the ice bucket challenge and not much else. While campaigns and fundraisers are of course important in raising awareness, knowledge of the nature, purpose and locations of clinical trials substantially lag behind. One of the biggest challenges for clinical trials is patient recruitment. This is is directly tied to the awareness of the study in the broader community, as people can only volunteer for trials that they are aware of. Further hindering awareness, public promotion of some research may not always be appropriate. Studies are at risk of being unknown to all except those that are required to know. Some patient advocate groups on social media now are ahead of the industry when it comes to connecting relevant patient populations to the latest and current research. Taking this further, Australian Clinical Trials aims to provide a centralised location integrated with social media in order to find and promote clinical trials online . On the website, trials can be listed and searched through freely. Trial details are managed by sites themselves, so all relevant search results are as accurate and current as possible. Trials can be searched by geographic location, recruiting status, keywords, and preferred participant characteristics (gender, age, condition, and so on). Importantly, the exact location of sites can be viewed in-line on Google Maps, displaying exactly where a site is and how to get there. On each trial’s page, you can easily obtain information about that trial through the text, pictures, and in some cases video. An in-line contact form streamlines the process of applying for a trial, but contact details for the recruiting sites are also present. Sites themselves can also be searched by location, with site pages listing all the trials they are currently running. An email notification system is also available for those that want to be kept up to date on the latest trials added to the Australian Clinical Trials database. You can choose to receive notification for specific trial categories, meaning you only relevant information about current clinical trials. Trials details can easily be shared to family and friends on social media, too. As more people search for trials, it will encourage sites to post more clinical trials on the website, generating more searches and interest. This positive feedback loop will ensure that strong, local communities surrounding clinical trials will grow and be remain sustainable. Australian Clinical Trials supports and nurtures existing clinical trial investigator sites and the trials they are running. Sites can create clear and engaging pages for each trial they are running by adding relevant participant information, a study category, a location, images, and embedded videos. All trial listings are searchable, meaning that suitable participants will be able to discover your trial. Furthermore, Australian Clinical Trials offers a special landing page for your study complete with its own URL. On this landing page you can display an online pre-screening questionnaire and participant contact details. Answers from this form will be emailed to you, making collecting details and contacting patients a simple process. One of the biggest revelations in the last 5 years of clinical trials are the new approaches to recruitment. Newly accessible data is offering a whole new world of advertising possibilities that you can take advantage of with the help of Australian Clinical Trials. The driving force behind this strategy empowers sites and sponsors with tools to effectively advertise and monitor the recruitment process on various social media platforms like Facebook, Twitter, Instagram, and Google. These platforms are optimised for advertising to specific and relevant audiences. As such, the reach of social networks can be leveraged to drive patient recruitment, often at minimal extra cost. Provided here is an image of a case study that clearly demonstrates the power of recruitment using the Australian Clinical Trials method. In addition to study pages, sites can make their own pages, which function similarly to a profile page. These pages have the same capability as study pages: they’re searchable, have an in-line contact form and can host pictures and videos. But in addition to this, sites can showcase their experience, specialities, equipment and advertisements for open positions. No other website offers public profiles for sites that are freely accessible. This online presence serves the dual purpose of both gaining new projects and new participants. Interested sponsors can openly view and choose sites for future studies as required. Participants can also discover sites close to them, enabling sites to continue building their volunteer database. Australian Clinical Trials assists sponsors during the setup and recruitment phases of clinical trials. Initially, sponsors or their CRO must spend time finding the right clinical trial sites for their study, which is a difficult and time-consuming process. Anyone involved in research should be well aware that accessing current and reliable site information is extremely valuable. Knowing where relevant sites are based and how to approach them is paramount efficient and effective clinical trial feasibility assessments and the subsequent setup. Some companies offer access to large databases of clinical trial investigator sites using an opt-out approach. These listings are usually obtained using bots that crawl the web or from an existing list of site contacts. Both approaches have the very real risk of containing outdated or otherwise inaccurate information, especially since sites are not required to update or confirm these details. In addition to the time cost of searching for and contacting sites, simply accessing these private databases can incur monetary costs of hundreds of thousands of dollars! Having to pay annually to obtain this information can add up quickly, with costs dependant on the number of users and access duration. Australian Clinical Trials solves both issues by providing you with a free listing of profiles that sites themselves create and maintain. This list is searchable and any site can add themselves to the website for free. The website is completely transparent: the only site pages you see are ones created by the sites themselves. This opt-in approach means that you have access to only current, accurate information about a site’s experience, capabilities, history, and trial experience, streamlining the site selection process. Ethics approval is another hurdle with which Australian Clinical Trials can assist. The website offers a tool that allows anyone to prepare clinical trial advertising templates for Facebook, Twitter, Instagram, and Google (a subset of ads are featured here). 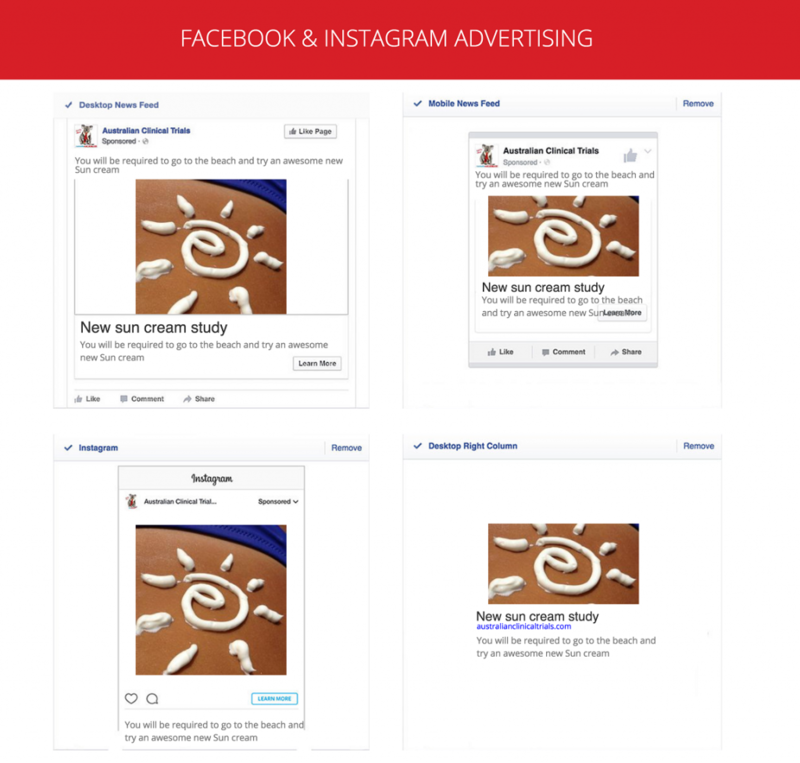 By feeding in text and image into the template generator, you can preview how your ad will look on social media. Several images can be uploaded as alternatives to the main image, in case they do not meet the specific advertising guidelines of the respective social media site. All these templates can be downloaded to submit to ethics committees for approval. Rather than manually generating ads, or worse, forgoing them completely, you now have a way to rapidly prototype and generate supporting media for ethics submission. Post-approval, Australian Clinical Trials is very happy to assist you in actually implementing these ads on social media, if required. As previously demonstrated, advertising in this way can significantly enhance the number of relevant participants that apply for your study. The ad can be linked to a landing page for your study, containing information and a pre-screening questionnaire to help sites assess and respond to potential participants in a timely and efficient manner. Increasing the visibility of sites and studies using Australian Clinical Trials and other social media platforms is our clinitiative, which has resulted in increased awareness of and engagement with clinical trials. New technology is combined with innovative ways of thinking in order to connect sponsors to sites, and sites to participants, in a cost-effective and community-focused manner. Remember that raising the awareness of clinical trials does not stop at any single website or initiative; everyone shares the responsibility to maintain a truly sustainable and informed clinical trials community. There are more exciting features in development to be launched on Australian Clinical Trials in 2017! Look out for these brand-new additions which will further empower all parties involved in the clinical trial recruitment process. If you have comments or ideas regarding our approach, or if you would simply like to know more about what Australian Clinical Trials can do for you, then get in touch with either the Datapharm Australia or Australian Clinical Trials teams today. We believe that a functional team has the potential to make the seemingly impossible happen. Australian Clinical Trials is lucky to be supported by Datapharm Australia staff, leaders, and resources. We have great friends, advisers and connections (social, industry and academic) who also support our mission and help make this site better. We also actively seek other like-minded companies who wish to support our clinitiative. If you would like to become a supporter, sponsor, advertise, or do something more through Australian Clinical Trials, contact us today and we’ll make it happen.